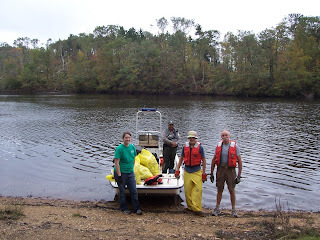 Thinking Out Loud In Sturbridge: National Public Lands Day Attracts 55 Volunteers, And Finds The Kitchen Sink. National Public Lands Day Attracts 55 Volunteers, And Finds The Kitchen Sink. 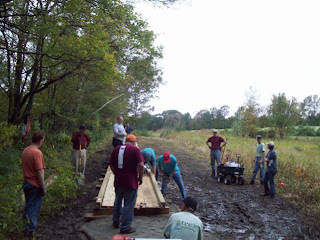 National Public lands Day, (NPLD) the nation’s largest 1 day volunteer event for our public lands locally held this past Saturday Sept 24thattracted some 55 volunteers in the Southbridge, Sturbridge and Brimfield areas. 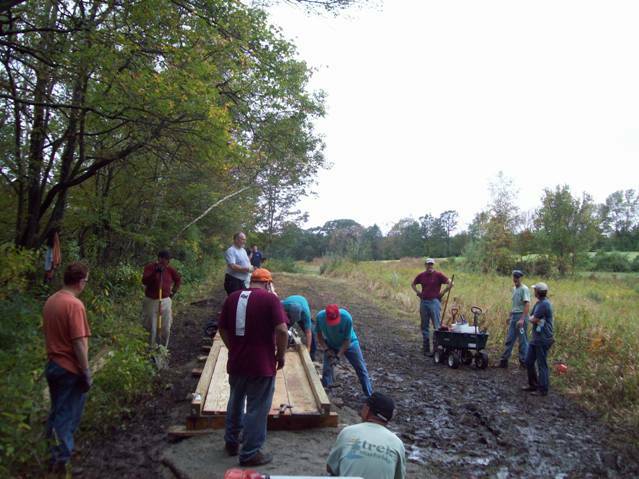 Projects ranged from invasive plant removal in Southbridge along the Heritage trail to Westville Lake, to tree and tornado debris clean up at East Brimfield Lake in Brimfield and Sturbridge, to construction of a 144 foot “bog bridge” on the Stafford turnpike trail at Heins Farm Conservation lands in Sturbridge. In Brimfield, Park Ranger Tom Chamberland, working with the Brimfield Trail Committee put together three crews of volunteers to each start on a section of the closed 2.8 mile section of the grand trunk trail to clear it of downed trees from the tornado in an effort to get the trail re opened. Three local tree companies, Northern Tree Service, Advantage Enterprises and DB Tree all donated brush chippers for this effort, who were assisted by the volunteers some who operated chain saws and others dragging brush. Of the 2.8 miles closed by the tornado, these crews were able to reopen about 1 mile of trail. At East Brimfield Lake, two boat crews assisted by a land crew cleared approximately 5 miles of shoreline of East Brimfield Lake, filling a 10 yard dumpster to capacity. Keith Beecher, Park Manager of East Brimfield lake said “ we closed the 360 acre lake and 5 mile river trail immediately after the tornado as we knew we had trees and other debris deposited in the lake by the tornado making recreation on the lake hazardous. 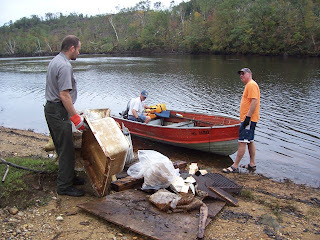 With this shore line clean up I am now more comfortable with opening up water based recreation on out lake and I want to thank all those who came out and help make this possible” Although most of the debris were pieces of foam, plastic and wood, the more notable exception was the recovery of a kitchen sink. Possible from a camper unit from one of the two Camp grounds located adjacent to the lake.